Home For The Holidays: Thomas and Friends Trackmaster Zip Zoom and Logging Adventure Review and #Giveaway CLOSED!! If your little one is a Thomas and Friends fan like mine is, then I am sure you have probably seen the ‘Misty Island Rescue‘ movie. If not then it is a must see for those Thomas and Friends fans out there. Well, the new Thomas and Friends Trackmaster Zip, Zoom, and Logging Adventure is just like from the movie ‘Misty Island Rescue‘. 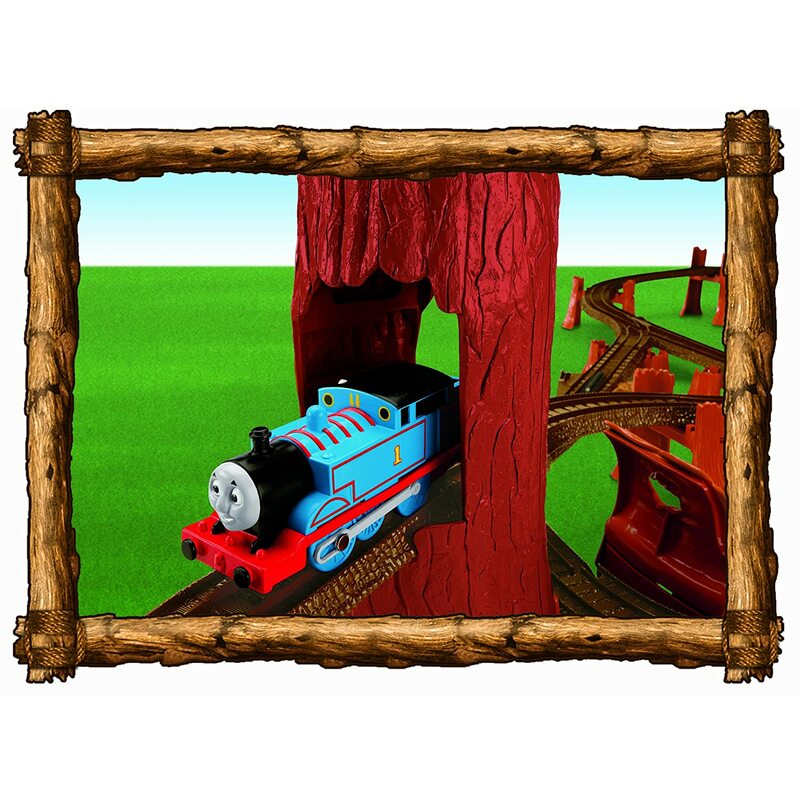 Your little Thomas and Friends fan can create their own logging adventure and relive moments from Misty Island!! My little man loves Thomas and Friends and with the Thomas and Friends Trackmaster Zip, Zoom, and Logging Adventure, he can have Thomas go on the tracks and through the tree trunks, then on the zip line log and go across to the other side. Then there is the awesome, working conveyor belt, where he watches the logs be taken up to the logging mill. The Thomas and Friends Zip, Zoom, and Logging Adventure provides hours of fun for the little Thomas and Friends fan in your life!!! This is another one of those must haves this year for the little Thomas and Friends fan in your life!!! I was given this awesome playset to enjoy with my son and review for my readers, courtesy of the people from Fisher-Price. And because Fisher-Price has been in the giving mood this holiday season, they would like to share one of the Thomas and Friends Trackmaster Zip, Zoom, and Logging Adventure with one of my awesome readers!!! Tell me which Thomas and Friends character is your child’s favorite! Leave your email with this entry!!! This giveaway is open to US residents. This giveaway will end at midnight on November 30,2010. Winner will be chosen at random.org and will be given 48 hours before another winner will be chosen. All products for reviews and giveaways are given as a sample from the companies. All opinions in reviews I conduct are my own. I was not paid to say anthing or review any products. Previous Post Home For The Holidays: Blunders Review and Giveaway CLOSED!! Next Post Home For The Holidays: Fisher-Price BIGFOOT the Monster Review and Giveaway Closed!! Hi, there! Visiting from New Friend Friday, and I have never seen this Fisher Price set before… and have 2 boys who LOVE Thomas. 🙂 Their fave is Percy. Have a great weekend! OMG My kid loves thomas!He likes Toby! My daughter has watched a couple of Thomas DVDs from the library and likes them well enough. Her favorite is Thomas himself. I follow you via GFC now. Thanks for also following me. I follow you on Google Friends Connect. My twin boys both like Gordon! Extra Entry for voting for you with Sears! Good luck! My boys are Thomas purists: they love Thomas! Is Your Child Ready For Preschool? Stay-At-Home Parenting: Move Over, Mom! An Incredible Summer made even better with Juicy Juice & Disney’s Incredibles 2! Hints for Amazon Prime Day Deals - Starts TODAY! Best family car rental with Silvercar & Peg Perego makes summer travel easier! Big Hero 6 The Series: Back in Action on DVD June 26th! Summer Camp Considerations: Can My Child Still Go If They Have a Severe Allergy? Do chinchillas make good pets? #giveaway Get ready to save the day with the Paw Patrol Ready for Action Set! Disney Princess Pleybox subscription makes it easy to surprise your little one! Do You Know How to Protect Your Child from Identity Theft? Marvel Studios' AVENGERS: INFINITY WAR Coming Soon!! Are You Looking Emotional Support Animal for Yourself? Disney Movies Anywhere Closes On February 28! How can you Choose the Perfect Electrician in Sydney? Rugrats Season 3 and 4 on DVD February 6th! Save Now with Kellogg's® Eggo® Star Wars Galaxy Adventure™ Buttermilk Pancakes ibotta Offer! #Giveaway Holiday Guide: Ducktales: Woo-oo! Is Your Teenager Itching to Drive? It’s Party Time! How do I Plan my Kid’s Birthday Party? #Giveaway Holiday Guide: MagicTape "Lego tape"
Foot Spa and its Benefits: Taking Care of your Feet! Goodwill Washington: Career Training, Shopping and So Much More! STEM Conference for Girls with Invent it. Build it. Where’s the Next Family Adventure Going to Take You? Should You Send Your Child to Boarding School? What Measures Has The California State Water Resources Board Taken To Reduce Nitrogen Runoff? Back to School Success with Hot Dots Jr.
Despicable Me 3 in Theaters Friday June 30th! How to Make This Father’s Day Most Memorable for Your Dad? Give Mom the Hip Baby Wrap this Mothers Day! #Giveaway Sweet N' Sour Slow Cooker Chicken with R.W. Knudsen Organic Pear + 2 Winners! Family Dinning at Bubba Gump Shrimp Co.
Healing Power: Why You Should Start Using These 5 Oils? Mommy Katie is a Generation Graco Mom Blogger Ambassador!!! Welcome New Contributor and Her Family to Mommy Katie! Use Advil® Menstrual Pain and Say "What Monthly Pain?" Get Holiday Ready With Target! Holiday Gift Ideas: Personalized Puzzle Gifts from I See Me! FREE Colgate Enamel Health Product Samples in Exchange for Website Review For the First 35 Who Sign Up!!! #Giveaway Everyday Princess from Neat-Oh! How Moms Are Smartly Taking Over Family and Work Life? Health Questions Answered with Amwell + Exclusive Visit Code For Readers! Are Destination Weddings Fading? What’s Trending? 5 Major Benefits of Kids Martial Arts: Here’s why you Must get your Kid Enrolled! Free Colgate Enamel Health Product Samples in Exchange for Website Review For the First 100 Who Sign Up!!! Machine Translation or Human Translation, Which Route is Best? Peppa Pig and The Muddy Puddles Project - Making a Splash for a Worthy Cause! Easter Fun with Skylanders SuperChargers + Super Charged Sales! Snacks for the Family from Fruit Me Up! Pablove Shutterbug programs and more…. Take Time to Be a Dad Today! The Way of Working Freelance Writers Follows! MixBook - For The Holidays! #Giveaway Holiday Gifts from I See Me! Cookies to Decorate, Cutout Cookies Ready To Decorate! LEGO DC Super Heroes: Justice League: Attack of the Legion of Doom! Is there Such a thing as too Much Calcium? Back to School Shopping and Personalization with Oriental Trading . Learn to #DrawSnoopy on His Birthday! How to Help your Child with a Homework?